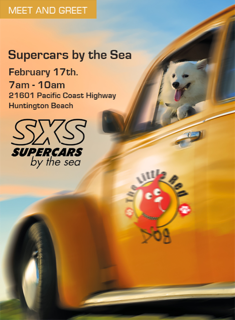 Come join SuperCars by the Sea & The Little Red Dog on Sunday, February 17th from 7am to 10am for the 1st Annual SuperPaws Meet & Greet at Huntington Beach State Park! Meet our friends from The Little Red Dog Rescue & some of their cutest adoptable pups. Help us raise money for Little Red Dog to help them continue their mission to rescue dogs from high kill shelters! Bring along your four-legged friend for a great morning of SuperDogs & SuperCars. SuperCars by the Sea features over 200 of Orange County’s greatest SuperCars including Ferraris; Lambo Gallardos, Huracans and Aventadors; Aston Vantage coupes and roadsters; Porsche Turbos and GT3s; ZR1 Corvettes; AMG MBZs and more. The Little Red Dog is a non-profit that rescues homeless dogs from high kill shelters and is on a mission from dog to find them their forever home.